It’s a new year, and new years are a great time to reflect on what we’ve learned and what goals we’d like to set for ourselves moving forward. 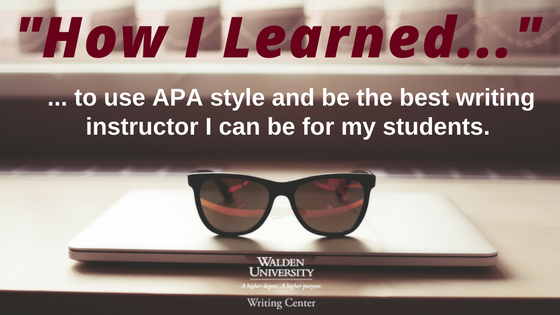 One of my personal accomplishments this year is learning APA style and formatting, which I did not know when I first joined the Walden University Writing Center. Today I want to share how I learned APA and, through practice and regularly double checking my work, became an APA master. It wasn’t easy, but I did it and you can, too! The academic writing background I come from is primarily Modern Language Association’s style (MLA), and I know many Walden students are familiar with one of the many other citation styles as well. There are many similarities between these citation styles in general, but the precise formatting is different. Additionally, APA style is more than just citations—it also involves an entire philosophy of clear, direct, specific communication. But I was determined (and required) to learn and understand APA for this position to best be able to help the students I work with. So I did. One of the major things I did to help become familiar with APA was to read the manual. Yep, I actually read the entire manual, and I seriously recommend that you do, too. It may sound tedious, but if you are unfamiliar with academic writing and specifically writing in the sciences, it’s essential reading to understand the underlying philosophy of APA writing—which is to let the facts speak for themselves, and be as clear and precise as possible for your readers. Reading the manual helped me to learn the guidelines, but it also helped me learn the reasoning behind those guidelines. APA can seem like a lot of arbitrary rules (like citing after each sentence, for example) but there are actually very concrete reasons behind these rules. The APA manual makes the reasoning clear. For example, citing after each sentence is required because writing in the social sciences tends to be research-heavy, so it is important for readers and researchers to know where the information came from and where they can learn more to fuel their own research projects. Mostly importantly, when you’re learning a new writing skill like APA style, don’t get discouraged. When I first started learning APA I was completely overwhelmed by how often you need to cite (in MLA it’s just at the end of the paragraph), but you will really get used to it. Use the Writing Center’s resources (like I do!) to help you stay motivated and in the clear. Here's the Writing Center’s overview page on APA. There are plenty of links and videos for you to check out on this page as well. Using different types of resources that stimulate different parts of your brain can also be a very helpful way to help you take in this new knowledge. I’m the kind of person who can understand concepts when they’re explained to me, but they don’t really sink in until I do something with those concepts for myself. The interactive components and examples of the Writing Center’s webinars and modules were key to helping me not only understand how APA worked, but how I could use it correctly. You can find our modules and webinars on our writing resources page here. Use them to put into practice the knowledge you gained by reading the manual. As you start to incorporate all this APA knowledge you’ve gained into your writing, don’t forget to keep your manual nearby. It’s important to double check things! I know it will feel tedious at first to double check your reference entries, search for use of passive voice, or remember to avoid using unclear pronouns like “we” —but it gets easier. Repetition is key to learning and mistakes are okay. Make a checklist of common errors or find some tools and pre-made worksheets that can help you remember all those tricky rules. Make sure you check through it before you turn in assignments and you’ll start internalizing the errors and see them less and less. Don’t forget: Your friendly Writing Center Instructors and Editors are here to help you along the way, but it will be most beneficial to you as a scholar to work on your APA over time until it becomes second nature! Just like research in your subject area, you really have to steep yourself in a topic before internalizing the ideas and concepts Maybe one of your reflections for this year could be on what APA rules you’ve mastered, and some of your goals could be to continue working on ones you still have difficulty with. It worked for me! Have APA questions? Email us at writingsupport@waldenu.edu. What do you want to learn next year? What are some personal triumphs from this year or previous ones? Share them below! Thank you for sharing your experience with APA mastery. My triumph for 2016 was leaving my spiral APA manual on my home office desk and getting the Kindle edition of the APA Manual on my electronic devices. All my notes, bookmarks and highlights are always nearby. It made my process for checking entries more efficient and effective. Thanks for sharing your how-to story! It's amazing how much technology can assist us in our day-to-day writing lives. Having access to your APA Manual where ever you are must be a big help. Although, there's nothing quite like your battered, marked-up, highlighted copy of the manual you've gone to a million times, right? Absolutely! My desk copy is my best friend, but I had to make room in my backpack for all the other literature I carry. I haven't completely crossed over to online books. It sounds like you are keeping a healthy mix--a few books in the backpack helps to keep the back muscles strong =). We hope your writing goes well in 2017! Great question! 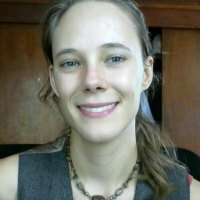 The manual that Claire refers to in this post, and the one that we all have next to our desks, is the Publication Manual of the American Psychological Association, sixth edition. (http://www.apastyle.org/manual/) However, you should also check with your adviser or someone in your program to see if there are other APA books worth having. Some programs have published quick reference guides that list the most commonly referred to rules and guidelines for the work you will be doing. Thanks for asking! Thursday Thoughts: How Do You Punctuate?